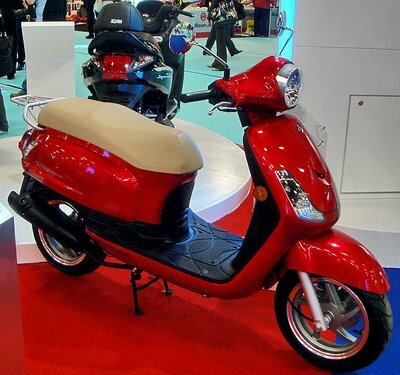 Here's the red version of this scooter! The retro design is really nice. Definitely a clone of the Vespa LX, but it is just as nice, if not better! If you are considering a Vespa LX, I would look into one of these as they are about half the price! I must say, of all the scooters i have seen, this one has one of the very best paint jobs. The lights work very well! There is plenty of floor space; I can even carry an extra grocery bag or 2 between my feet. The seat is amazingly comfortable! And it is nice and big, so that, unlike most scooters of this size, a passenger is comfortable. It has lots of under the seat storage space. It has lots of helpful helmet and bag hooks! The storage rack is very strong. I like the cool seat open button. The buttons are all easy to find, read, and use. This is one great scooter!!! All in all, I would highly recommend the SYM Fiddle II. Whether you need the 50cc, or the 125cc, it is a great scooter! This scooter would be great for a beginner, or someone interested in a Vespa LX, as it is virtually the same... for half the price. I just love my new SYM Fiddle scooter! Yes! the liking of this bkie Has grant me into much hiher cast society in India! It has very much liking avail too it. The Taxes and fuol rate are so low as no to introod on much needed $ for operational services and such. Their is many things about this bike that is very much liking. The paint is pure ITALIAN! very much shiny! The engine purrrs like monkey with fool bellies! Moderator, would you please clean this up it looks like crap. `I am aware may very well not provide to be able to to be had details specifically as you will be the person who explains to you that on your own website. My partner and i nonetheless observed a niche site referred to as that we realize could be beneficial to the viewers. It is a good inspiring content. We are just about pleased about the beneficial perform. Anyone fit actually beneficial details. I was looking for same featured scooter. It is red and I love it. Thanks for sharing picture. I am beginner and I think it will be my best choice in scooters. Hope you will find the ukessayservice service the best one in town. Where can I get list of companies offering Scooter in the market? so good luck and lets hope my sym completes the job for me!!! I purchased a used Fiddle II for my wife as an upgrade from her Honda Metropolitan. The Fiddle II is well built and very reliable, excellent paint, good brakes and smooth engine. I have done a few oil changes and replaced a headlight switch and the belt and rollers at 5600 miles due to bike having been stored outdoors for at least a year under a cover that trapped moisture. It is more comfortable with a passenger than my Buddy 125 although not as fast, it is a bit bigger scooter than the Buddy. I like it so much I bought a SYM Mio 50 as a spare commuter scooter. SYM scooters are great values. Thanks for the review, Juliette. You did a great job of informing us of all the highlights, which is really helpful. I hadn't heard of the Fiddle before, so it's great to get your review. My local dealer stopped carrying SYM scooters because of some dispute over parts with the manufacturer. It's a real shame because people here seem to love their SYMs and it's the brand I wanted my hubby to look at. Have fun with your scoot and if you ever want me to replace the picture here with one of your actual green Fiddle, then email me through my contact form and I'll tell you how to get it to me.